i'm sure there was a lot burried in there ... sorry if it wasn't easy to find. So a G80 for laptops/notebooks? The pairing of Intels Santa Rosa platform with Vista in the 2Q 07 is next big thing for the first tier notebook manufacturers & all they need is a matching G80 for this setup. Nvidia currently caters to Desktop requirement/needs with the new G80 releases,wonder how the notebook/server versions will be-with Vista ofcourse. Vitual memory is probably a good thing for most cases, but in the graphics arena, this *could* potentially make for sloppy/ bad coding practises. Knowing a lot of game devers (some of which actually work for well known companies), I've heard them from time to time complain about maxing a 16x PCI-E pipe. What I'm trying to say here, is that while it would be a good thing for never having to run out of texture memory, but that system memory, and definately the swap disk can not hold a candle to the memory bandwidth that most Video cards are capable of. End result, is that you definately *will* get a performance hit. All this, and we already know the memory bandwidth capabilities of modern PCs, suffice it to say, the most we'll see from current systems is what ? 12-13K GB/s ? Even a 7800GS can do roughly 35 GB/s on card. A 7600GT ? 22GB/s ? 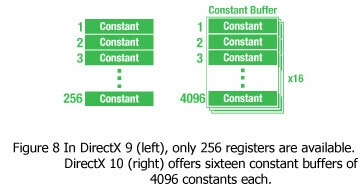 Still I think Directx10 is a very good thing, and as I didnt read the whole article, perhaps a missed a little ? Reason being, I've been reading about Directx10 since April, and a friend of mine was privy to some of this information after an interview with ATI. I don't know what is the problem but I'm really unable to see the images within the latest articles from Anand...Can anyone give me a suggestion? What might be the cause of that?